The Art B. Thomas Carousel is located in Historic Prairie Village, a 120-acre museum complex in Madison, South Dakota. An historic steam engine, which powers the carousel, and an historic ticket booth are also part of the carousel property. The carousel was built by the Herschell-Spillman Company of North Tomawanda, NY between 1901-1920. It's a portable, wooden, steam-powered carousel with 28 horses and 2 chariots -- the type that was taken to county fairs across the U.S. in the early 1900's. The hand-carved wooden horses and chariots are original to the carousel, as are nearly all its mechanical elements. In its earlier life, the carousel traveled with the Art B. Thomas Carnival. It was sold to Historic Prairie Village in 1966 and, since then, has been operated seasonally, open to the public for rides. The carousel is a relatively rare example of a Herschell-Spillman Steam Riding Gallery and is significant because of its intact nature. Portable wooden carousels, worn out over the years by the wear and tear of travel as well as repeated assembly and disassembly, are relatively rare. The Art B. Thomas Carousel is rarer still because of the motion of its horses: the horses rock back and forth on an underside metal rocker, rather than moving up and down on a pole. To commemorate the 100th anniversary of the carousel's manufacture and the 50th anniversary of its move to Historic Prairie Village, Prairie Pasque #1072 and the Historic Prairie Village board have committed to a fundraising project that will support a complete restoration of the carousel. The price tag: a whopping $210,000! To date, nearly $195,000 has been raised through cookbook sales, grants, direct-mail appeals and good, old-fashioned bake sales! An old dresser that has beautiful wood-grain, the lamp that reminds you of Mom, or a mirror to complement your spare bedroom – all that and more treasures were available at the annual Antiques on the Square event at the Yavapai County Courthouse Plaza on June 4, 2017. The event is sponsored by the Thumb Butte #1284 and Yavapai #1506 Questers, the event takes place from 9 a.m. to 4 p.m. on the Gurley Street side of the courthouse plaza in downtown Prescott. Over the many years of their sponsorship, the show has raised an average $6,000 annually, all of which has been donated to various P&R projects in and around the Prescott area. More than 50 vendors showcase ephemera, art, glass, jewelry, pottery, furniture, primitives and unique surprises at the event. And, 100 percent of the profit goes to support regional historic preservation and restoration projects by area Questers. Originally published in Daily Courier, Prescott AZ on June 1, 2017. Photo by Les Stukenberg, from the 2015 event. Grosse Pointe #147 Celebrates 104th Birthday of Emerita Member! The ladies of Grosse Pointe Questers #147 were delighted to honor emerita member Dorothy Denomme at their December 2016 meeting. Dorothy was born on Christmas Day in 1912 – yes, she celebrated her 104th birthday this year! Dorothy has been a member of the Grosse Pointe chapter and took on the two-year presidency in 2000, just as she was turning 88. For many years, the chapter wished Dorothy a happy birthday every December. But, in 2012 when she turned 100, it became much more special indeed. Dorothy is a remarkable lady and it is the chapter's privilege to have her as a fellow Quester and even more so as their friend. 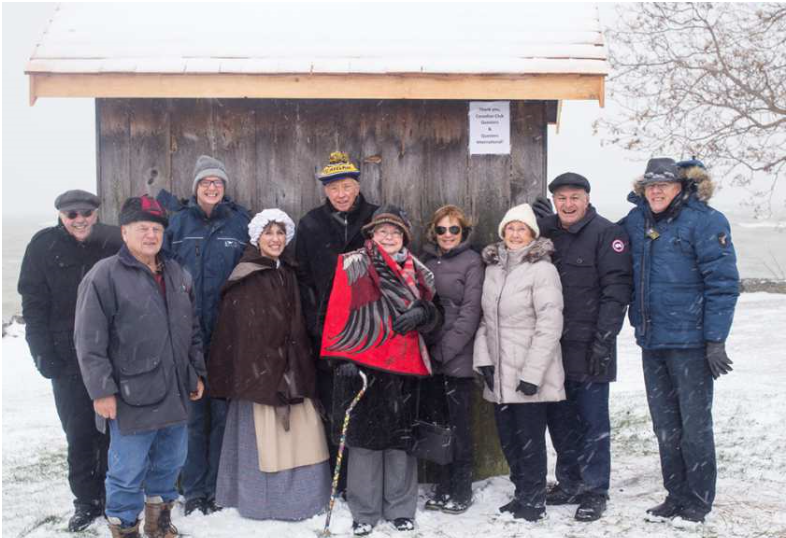 The smokehouse at the John R. Park Homestead Conservation Area in Windsor, Canada, has been restored, thanks to an International Questers grant and money raised by Canadian Quester Chapter #1417. The chapter received a $2,200 International Questers grant and then raised an additional $1,260 to lift the building, pour and set new concrete foundation corners and install a new cedar shake roof. The badly deteriorated shakes on the old roof were removed, special waterproof insulation material was placed on the remaining roof, and the new shakes were installed. Ventilation holes were made under the ridge line and a zinc ridge cap was installed to protect the new roof. The building was last restored in 1977. The homestead is located on the north shore of Lake Erie and is subjected to a variety of weather conditions throughout the year. “Prior to the restoration, the smokehouse was leaning toward the lake, making it impossible to open the door or use the building for demonstrations," said Kris Ives, curator and education co-ordinator at the homestead. “The cedar shingle roof had deteriorated and the 1850s building could no longer function as part of the living history agricultural museum, which portrays the Park family’s life in Windsor some 170 years ago. Now, with the new foundation and roof, along with the repairs to the door and the installation of a proper vent, the building can be used as an exhibit, illustrating the principles of smoking foods for preservation, and it actually functions as a working smokehouse. The homestead staff and volunteers have already been using the restored structure for authentic demonstrations.” The site is part of the public school curriculum, so the repairs were essential. 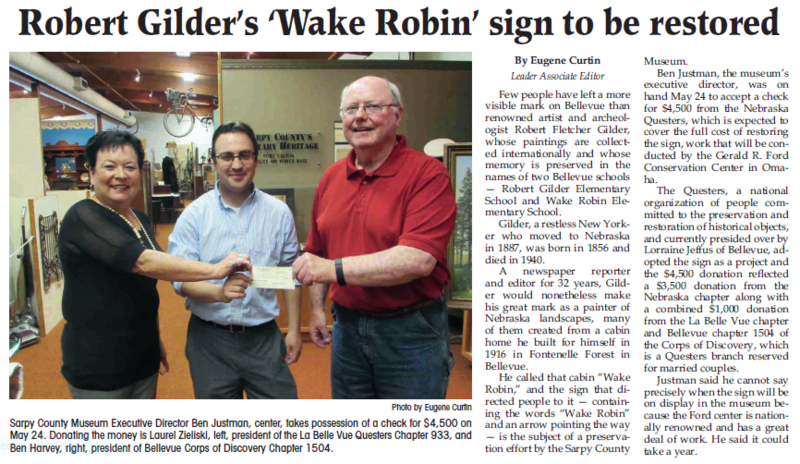 “The Questers are wonderful supporters of local heritage,” said Essex Region Conservation Authority chair Ed Sleiman. The John R. Park Homestead International Questers grant was only the second to be awarded in Canada.